Mr. C in Paris with his friends from EF Tours. Behind us was a performance art group doing something with trampolines. It was… performancey and arty. Since the very beginning, Minooka TAP has been working with a company called EF Tours to help arrange their travel. EF has been around doing this student travel thing for 50 years, so they’re a pretty good company to partner up with. The folks at EF are pretty hands on, and like to know what groups like TAP are up to. They check in with us pretty regularly about our travel plans, what we like and dislike, what our goals are, fund raising ideas, and all sorts of stuff. EF is kind of like a big family, so every once in a while they have little get-togethers for teachers so they can meet other teachers from other schools that run programs like ours and we can share ideas. One of the coolest things EF does is their International Training Tour. When a teacher at another school starts up a student travel program in their community, EF offers them a chance to go on a “training tour.” It’s kind of a cool concept, because EF will send a few experienced travelers that work for them and a couple of their “experienced group leaders” (like Mr. Curtis) to act like the teachers on a trip, and a group of 30-40 teachers who are starting their new travel programs get to be the “students.” Those new teachers get to see how one of these trips is run first hand. They get to share ideas with one another, pick the brains of the EF staff, and ask those “experienced group leaders” any questions they have about running a travel program. 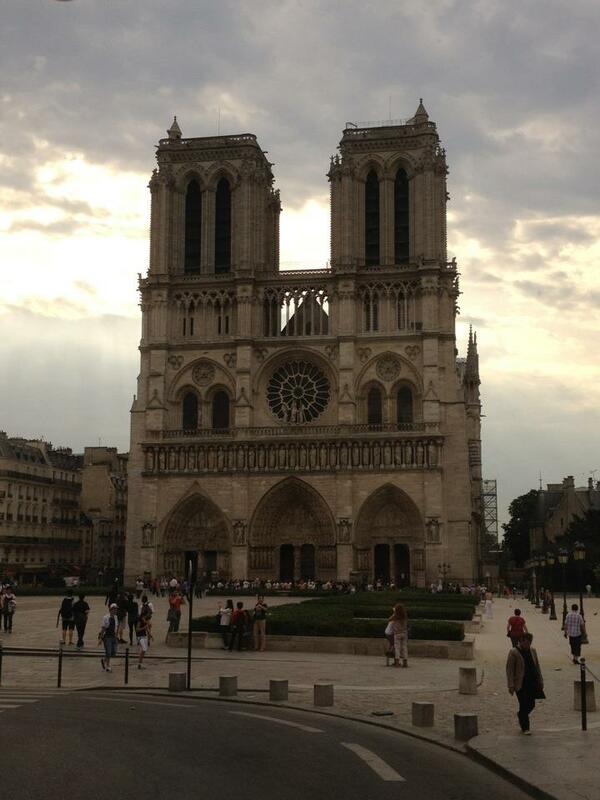 No hunchback sightings at Notre Dame, but I did see a squirrel with a limp – does that count? 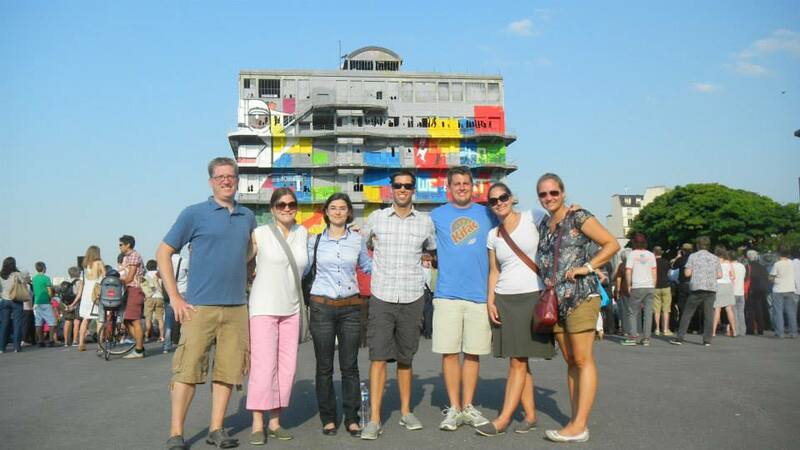 In the summer of 2012, EF asked Mr. Curtis to come along on a training tour in Paris, France to help about 40 teachers from all around the Mid-West learn how to run their own travel programs. It would be Mr. C’s job to show them the ropes – teaching them what the TAP teachers would do with their students in every possible situation – hotels, airports, buses, museums, walking around the city, meal time, and even during shopping opportunities. It was an amazing experience for Mr. Curtis, because he didn’t get to take one of those training tours when TAP was starting out, so he learned a ton by hanging out with so many other teachers who want to give their students the same opportunities to experience the world. Plus, he got to hang out in Paris. Not a bad job. I had no plans on going to Paris until after we’d returned from our Japan trip in June. About a week after we got back, I was getting ready to move – we’d just gotten a new house – and spend the summer with my kids. EF Tours called me up pretty much out of the blue and asked if I would help out with a training program. At first I figured it was in their office in Chicago, so I figured a day away from moving boxes would be nice. They wanted me to speak for about an hour on preparing students for foreign travel. That’s a subject I could speak for a few days on, so an hour was easy. I told them I’d be happy to help. Then they sprung on he that the conference was in Paris. That was a bit of a surprise, but how could you turn down a trip to France? After the initial shock, I was really excited to be a part of EF’s 2012 Paris training tour. It was a cool experience in so many ways – partly because I’d been to Paris before, but it had been almost 20 years. Last time I was there, I was just a college kid who had only seen a few places in this great big world. Now I’m two decades older and have had the great fortune to see a lot of really cool places. I enjoyed Paris back in 1995, but I don’t think I really “got” what I was experiencing back then. So many people think Paris is one of the greatest cities in the world, so I was pumped to see it again and compare it with some of the places that I put on that “greatest cities” list. Since I was considered part of the EF staff, I got to fly to Paris a day ahead of the 40 (or so) new teachers. That gave me a full day in France before the actual work began. I got to meet the folks I’d be working with right away. Our tour director, Tristan, one other experienced teacher (Mrs. Stanich from Oswego East High School), and five EF staff members, were all really cool people. That first day was amazing. It’d been a long time since I’dd traveled without a huge group, so it was fun to be able to move quickly and try different things groups couldn’t do. There was plenty of time for the touristy stuff on the other days, so on that first day in Paris, Tristan wanted to show us his neighborhood. It was just on the outskirts of Paris, so no views of the Eiffel Tower or Notre Dame, but it was really cool to get into a part of Paris that most foreigners don’t bother to visit. It reminded me of the time our TD in Spain, Juanito, took all 40 of us to see his apartment. 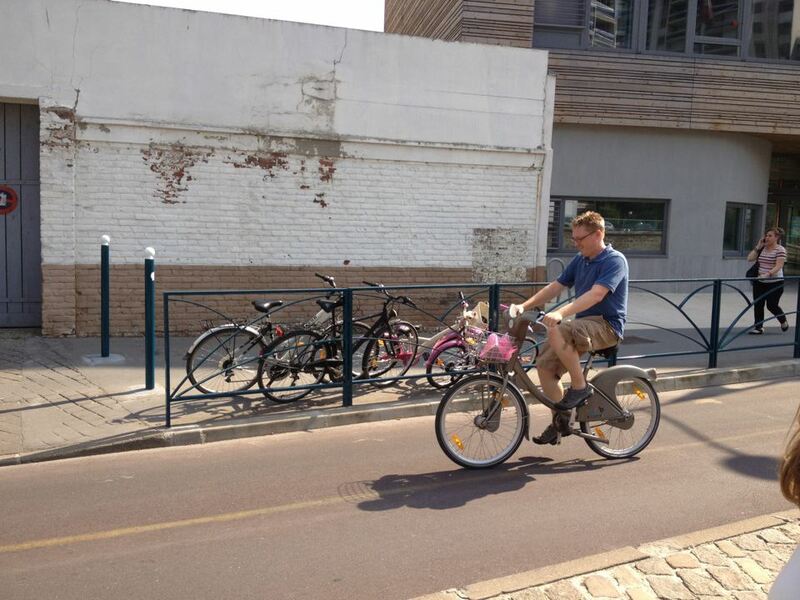 Mr. C takes a romantic bike ride through Paris. Alone. Tristan had us strolling through this up and coming neighborhood that looked as if it might have been a pretty rough place just a few years earlier, but big warehouses and rundown apartment buildings were slowly being replaced by luxury apartments and high-end lofts. Tristan and a few of his friends had actually bought an entire building, converting it slowly into apartments for all of them. For now they shared one three bedroom space that was absolutely beautiful. Paris is one of several cities that’s trying to go green by providing bicycles all around the city for people to rent. There’s no way we would’ve been able to rent bikes for 40 people on a TAP trip, but with just the handful of us, we used a credit card to get one bike off one of the racks near Tristan’s place (you could then return it to any of the bike racks located all throughout the city). We took turns riding along the cobblestone path beside the canal, which was just one of those surreal moments you get sometimes when traveling. 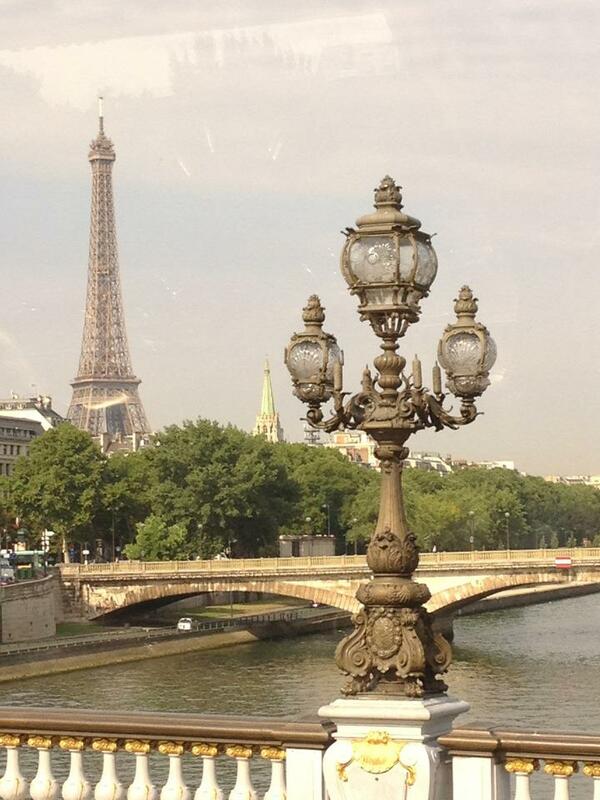 I took this one out the bus window as we took a driving tour around Paris. We ate dinner in Tristan’s favorite neighborhood spot, an Italian restaurant. It sounds weird to eat Italian food in Paris, but we actually ate at an Italian(ish) restaurant the first night in Tokyo a month earlier too. I tried carpaccio, not knowing that I was ordering thinly sliced raw steak. Sometimes in foreign countries I just pick random things off the menu, and I’d heard the word car-pach-ee-oh before, so I figured it must be something good. Then the lady set down a plate of raw meet and artichokes in front of me. Not what I thought I was getting myself into. But, when in Rome… Surprisingly, it was really good. With so few of us, everyone was able to share dishes and try lots of different stuff, so I had some duck and a few delicious pasta dishes too. After that, we headed back to Tristan’s place, sitting out on his rooftop deck, sipping some wine (it’s okay, I’m waaaaaaaaaaay over 21), and preparing ourselves for the adventure ahead. The next morning the new teachers arrived, so we introduced ourselves and began touring Paris. Over the next few day hit all the spots tourists are supposed to hit, along the way answering the other teachers’ questions and helping them understand what we do here in Minooka to make this program so awesome. We saw the Louvre, the Eiffel Tower, the Arch de Triomph, the opera house, the Bastille, the Palace of Versailles, Montmarte and Sacre Cour, Notre Dame, and, of course, the Champs Elysses. One night we went for a cruise on the Seine River, soaking in all the warmth and ambiance that Paris has to offer. Of course there was work to do too. To be completely honest, those five days with all those teachers asking a gazillion questions was fun, but it was a thousand times more work than a normal TAP trip. On our trips with students, the kids are really well prepared for what they’re seeing. For most of the new teachers, the idea of traveling with their students was totally new to them, so they had tons and tons of questions. I’m not complaining, though. Five days working really hard in Paris is still five days in Paris. One entire morning was spent in a conference, using more of a classroom setting to teach the new teachers how EF and Minooka TAP work. I was pretty pleased with my hour long presentation, but even more excited with how much I enjoyed being back in Paris. As we strolled through the city, crossing the bridges, looking up at the beautiful churches, and dining in the sidewalk cafes, I knew that I’d return again someday. Next time, though, I’ll have to bring the other TAP teachers and some Minooka students.